Apart from simply analyzing the effect of American activities on the politics of the island, author S. R. Joey Long also examines their impact on the relationship between Great Britain and the United States, and how the Anglo-American nuclear policy toward China and the establishment of a regional security institution (the Southeast Asia Treaty Organization) affected the security and decolonization of a strategic British base. Long sketches a highly detailed and nuanced account of the relations between the United States, Great Britain, and Singapore. He not only describes the often clumsy attempts by covert American operatives to sway top political leaders, infiltrate governments, influence labor unions, and shape elections, but he also shows how Eisenhower’s public initiatives proved to have far-reaching positive results and demonstrates that the Eisenhower administration’s policies toward Singapore, while not always well advised, nonetheless helped to lay the foundation for friendly Singapore–U.S. relations after 1960. 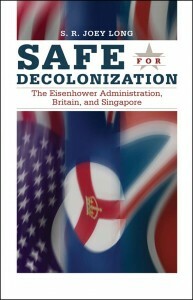 As the first multi-archival work on the U.S. intervention in Singapore, Safe for Decolonization makes an important contribution to the literature on Southeast Asia–U.S. relations. It will be of interest to specialists in decolonization, diplomatic history, modern Southeast Asian history, and the history of the early Cold War. S. R. Joey Long is assistant professor of history and international affairs at the S. Rajaratnam School of International Studies, Nanyang Technological University, Singapore. A Fulbright scholar in 2010, Long received his Ph.D. in history from the University of Cambridge. His research interests are in the history of Southeast Asia–U.S. relations and contemporary Asia-Pacific security.